You can both GET and POST with the classes. Behind the scenes this is accomplished with two script libraries. One back-end worker class made with Java (class:CWebContentConsumerJava) which does all the heavy lifting, and a LotusScript wrapper class (class:CWebContentConsumer) which uses the LotusScript-to-Java bridge LS2J to interface the back-end java directly. Click on “Read more” to read the details. One of the missing pieces in LotusScript has always been some kind of HttpReader, enabling us to communicate directly with the web. Lots of Notes-developers has therefore performed these tasks in Java within Notes/Domino. Java has excellent support for this, and luckily Notes/Domino host Java in a decent way. Note that I don’t do anything new here, I simply combine stuff from various places. If you download and check out the code, you’ll see links to several sites where I got the original idea, snippet or code from. Hopefully I haven’t forgotten any! One particular blog was very inspirational for me, Eric McCormic’s “Server REST with authentication”. A set of java classes with base class CoreConsumer. It contains most core logic, such as getContentCore and postContentCore. These methods contains the code that actually communicates with the REST Services. Subclasses JSONConsumer, XMLConsumer and HTMLConsumer contains more tuned methods for their respective content types, and also preset the content-type for you. At the time present, the JSONConsumer is the only one with a reasonable feature set. The XML and HTML consumers are only there to show the logic. Furture improvements may go along the lines of letting XMLConsumer have a powerful XPath query mechanism etc. JSONConsumer now has JSonPath-support and an internal XPath-like way of querying JSON. A LotusScript class wrapping the java class above via the LotusScript-to-Java bridge LS2J. Use the LotusScript-class in your own code as you see in the sample above. How to use in your own code? The sample database contain two script libraries, the “class:CWebContentConsumerJava” and “class:CWebContentConsumer”. The first script library is written in java, while the latter is written in LotusScript. Copy these two script libraries to your own database, and you are ready to go. Personally I like design inheritance, so I rather inherit the design from a central code-snippet database. Makes it much easier to maintain the code in one place! But that is of course up to you. In the following explanations I use REST services from some companies that kindly provide dummy services for us to use. Note that both the services can disappear or they can change the way they work, so please don’t focus too hard on the services themselves. If they disappear, simply look up other sample REST Services on the net. Below you’ll see a lot of LotusScript code, simply using the script library class:CWebContentConsumer. Later I’ll point out some details about how the LS2J works and some details from the back-end java code. You will also find the code presented below in two agents named “Test GET” and “Test POST” if you download the sample database. Note that I have skipped some of the ordinary variable definitions in the description below. The code in the sample database is fully working. In the first screenshot you see how small the code can be. If everything goes well you have the complete JSON in the string variable! You can of course check if any errors occurred as well. The classes also support a simple debugging system, so you can track the different steps in the back-end java class. You may want to see extra debug information from the back-end java classes. Turn it on with SetJavaDebugLevel before other calls, and retrieve the result with GetJavaDebugInfo after other calls. Remember to call most of these Set-methods before the Get-methods. Some REST Services may be slow to respond. By default the classes will wait 5 seconds. Perhaps you need to extend this time? Some REST Services also needs URL parameters, which ends up in the URL itself. Instead of specifying them directly at URL-level, you can use the AddURLParameter to add any number of URL parameters. Note that you also can empty the request headers with EmptyRequestHeaders and ditto with the EmptyURLParameters. What content-type do you want? How to get values with JsonPath? JsonPath Is a library that let you query the JSON almost like XPath. In other words, it is pretty easy to retrieve elements via queries. 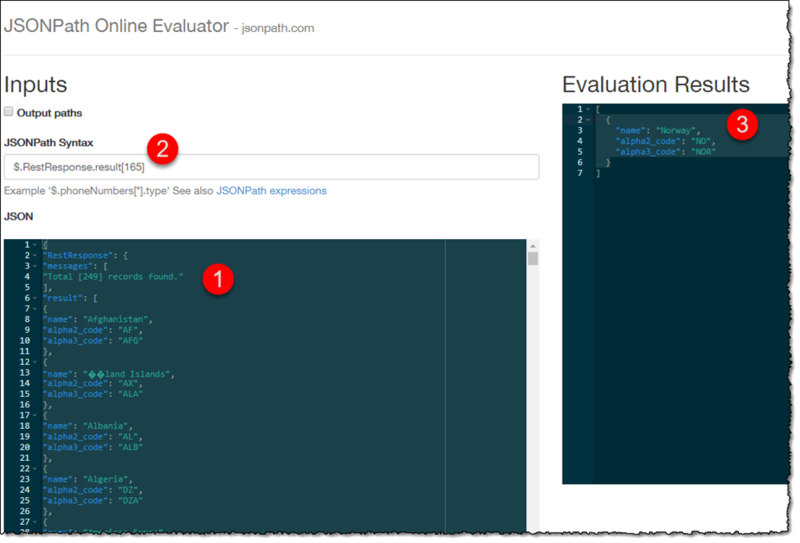 If you are working with JSON, head over to the super resource JSONPath Online Evaluator. 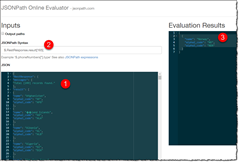 Simply copy the JSON from the browser, and paste it into the online evaluator, and start querying. Below you see the c ountry-JSON and the instant query result! First (marked by 1) I pasted the JSON. Then I entered the JsonPath-query, marked by 2. Instantly the result is shown at 3. You can of course grab elements and arrays and what not from the JSON. My classes also support that you can use a method prepareJsonPath with any other JSON, and use the same GetJsonPathValue-calls on your JSON. How to get values by "json path"? … Which will retrieve the first name at the specified path. The agent "Test POST" calls a REST Service and post information. I have been using the RequestBin (https://requestb.in) which allows you to create a temporary URL and post up to 20 times to it. These classes support posting with or without basic authentication, just like the Get-methods. 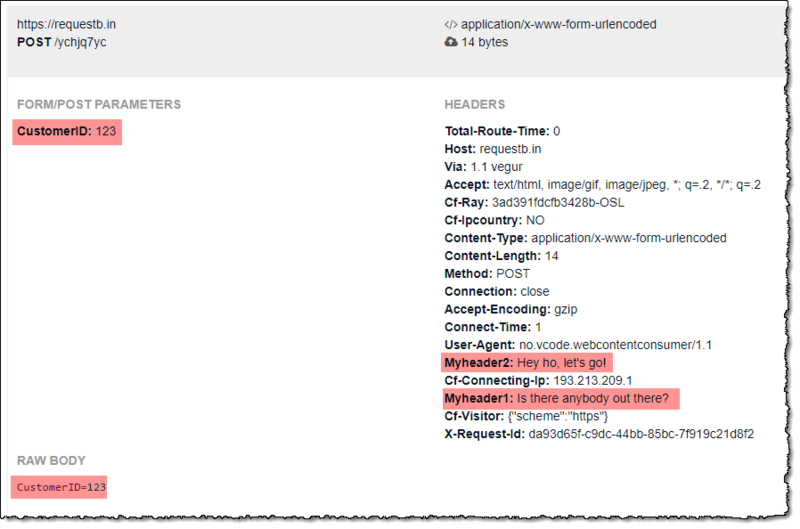 When posting you often need to add additional HTTP request headers and perhaps even add URL parameters. When posting finishes, it often returns some kind of response in the form of response headers together with perhaps json or XML. Note that all the sub classes (CJSONConsumer, CXMLConsumer and CHTMLConsumer, has heir own post-methods, in order to get everything right regarding content-types etc. This means that CJSONConsumer has a postJson and PostJsonWithAuth, CXMLConsumer has PostXML and PostXMLWithAuth and finally CHTMLConsumer has PostHTML and PostHTMLWithAuth. You can, if you want to control everything yourself (using SetUserAgent, SetRequestType, SetURLCharsetName, SetTimeout etc), use the core-class CCoreConsumer's PostContent and PostContentWithAuth. This way you can control lots of stuff! Remember, it it easy to *use* other rest services (in other words GET) and inspect the response etc, but it is somewhat harder to test a POST. This because it means that the server needs to respond to arbitrary rest POSTS. Services like RequestBin let you create a temporary "bin" meaning that you end up with your own bucket you can test to. 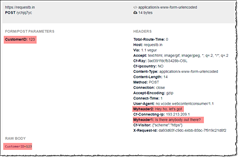 Often these services also shows you want headers and payload the POST has posted. In the sample below, I use the RequestBin URL https://requestb.in/ychjq7yc NOTE THAT THIS MAY NOT EXIST WHEN YOU TRY THE CODE!!!! You may use the URL https://requestb.in/ychjq7yc?inspect to see the responses! I have marked with red some of the request headers and parameters coming from my code. Or, you can get a single one, if you know the name. Use the back-end java JsonPath and "Array Maker" with your own JSON! 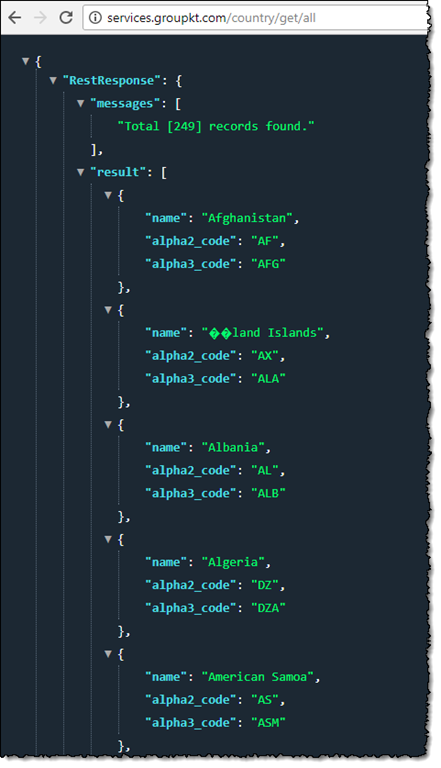 Behind the scenes, the methods that prepare the retrieved JSON-strings for use with both JsonPath and the "Array Maker", has also been made available to you.
' Perhaps you want the Keys and Values instead? Kanena problema! Phew! Good luck folks, hope this helps somebody! By the way; The downloadable sample database is here. This is great work you've done, it's been hard getting LotusScript out of it's box. 3 - @Brian and @Stuart, thanks for the kind words! And thanks for the update to the Eric McCormic site! must be called before accessing getOutputStream -- so just move the authentication code block up a little. 5 - I like your idea and solution. Did I something wrong (I followed your description) or is there a bug in the Java library? 6 - Thanks for an excellent job. Have been looking for something like this for some time. We built our web service consumers using the MS XMLHTTP object and while they work just fine I would be keen to try something else. But unfortunately I cannot get the code to work, because we have to specify a number of proxy settings for the request/response. Proxy server, username and password. Can your code be extended to handle proxy settings like the ones I need. It may well be that such settings are easy enough to code in Java, but that's beyond my capability I'm afraid. Thank you for publishing the classes!